Poll 22 - "Why stop at ten? There are really an infinite number of dimensions." Poll ended September 6, 2008. Votes were split right down the middle, half agreed while half disagreed. 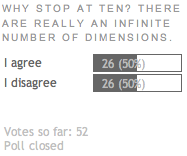 This is one of those polls that could probably have used an "I Don't Know" option - until confirmed evidence comes forward to prove that anything more than the third or fourth dimension is real, how can any of us say for sure? "After that, it's turtles all the way down"
No matter how many dimensions we care to imagine, I believe there needs to be an ultimate state that, in the same sense that Godel's Incompleteness Theorem uses the phrase, is "outside the system". Otherwise you're stuck in endless repetitions, because no matter where you stop, someone can then ask "but where did that come from". The phrase "turtles all the way down", then, comes from a story demonstrating this concept of "infinite regression", which is one of the ways of thinking about infinity. Ah, infinity. This is one of the questions that comes up sometimes after people watch my animation about visualizing the dimensions: "infinity" is one of those words, like "universe", that seems to have a contradiction built into its definition. How can there be more than one universe when the word was intended to define all that there is? Likewise, how can there be more than one infinity? How can there be infinite divisions between zero and one, an infinite set of numbers from the sequence starting one, two three, and yet another infinite set of numbers from the sequence starting two, four, six? I've come to love the phrase "there are many roads to infinity". In my blog entry "Infinity and the Boltzmann Brains" I talked about the idea my friend Michel from Norway reminded me about: parallel lines meet at infinity. This is more than just a useful device for drawing pictures in proper perspective! This is what really happens. Two parallel lines meet at infinity... and not just once but in either direction. And this is where I have pointed to the work of physicist Sean Carroll, who a few months ago in Scientific American advanced a very similar idea - time makes sense in either direction, and once you get "outside" time you are in the same enfolded symmetry state that some call the "omniverse", which would be the same both "before" the big bang and "after" the end of the universe. So, what it comes down to is that with the way of visualizing the dimensions we're talking about here, every single dimension extends to infinity within its own set of possibilities. The first dimensional line... travels to infinity in both directions. The second dimensional plane... infinite in four directions. And so on, all the way up. As with "turtles all the way down", some people argue that you could keep adding dimensions forever, until you reach an infinite number of dimensions, at which point you've reached the same idea that I'm talking about - those infinite dimensions, viewed as a whole, would be the thing that just "is", the thing that is "outside the system". We've talked in my book and in this blog before about physicist Juan Maldacena's theory that our universe is really a hologram. I believe this concept is easily imagined within the construct - because every single dimension already extends to infinity, the idea that each "point" you observe contains/is connected to the whole is already in there. Here's what it comes down to for me: whether you believe there are three dimensions, four, seven, ten, twenty-six, or even an infinite number of dimensions, at the place you stop you need to be able to say "now I have defined the background state from which everything else is derived". For me, my way of visualizing the dimensions achieves this at the tenth dimension. But regardless of what you prefer to call it, what we are talking about here is the underlying, unobserved fabric from which we can generate all other possible expressions of matter, energy, and information: Gevin Giorbran called it timelessness. The "point" of indeterminate size, then, becomes an amazingly powerful idea because no matter where you place that point, and no matter what dimension you place that point within, it is at the center of infinity! Here's a way to think about that idea: no matter where you place a point on an infinite line, there are values extending to infinity and "negative infinity" in either direction which cancel each other out... in other words all of those possible values on either side of the point always add up to zero. Which gets back to the dangerous idea of "zero". When you add every possibility for reality together, what does it add up to? Zero. All states enfold together, and our universe doesn't spring from "nothing", it springs from "everything". As Gevin Giorbran liked to say, the zero (the enfolded symmetry state that is outside the system) is the pie, and our universe is a tiny slice of that pie. And that's a powerful idea. What Does Infinity Plus Infinity Equal? Why Do We Need More Than 3 Dimensions? Next: Poll 23 - Why is the speed of light the limit? Click here for the archive of polls 1 to 10. Click here for the archive of polls 11 to 15. Click here for the archive of polls 16 to 20. What would happen to the universe if there was a rip in the universe? Could someone from another universe rip into this universe? Can we change the fate of the universe? Could someone from another universe rip into our universe? Can we change the fate of the universe? Wow, imaginaryuniverse, sounds like you're describing John Cramer's amazing science fiction novel, "Einstein's Bridge". Are you familiar with it? Cramer is well-known as one of the better "hard science" science fiction writers, and his novel describes what happens when a particle collider causes a rip in the universe. I'd recommend it highly if you haven't read it! Britannica Encyclopedia explains that String Theory requires 11 dimensions to be consistent, while Columbia Encyclopedia says that string theory consists of 10 dimensions, as you do. What the inconsistency? Why don't you profess 11 dimensions? Hi Karl, this is something I talk about regularly. String theory had multiple versions, which were based upon ten dimensions - nine spatial dimensions plus time. M Theory unites five different versions of string theory by saying there are ten spatial dimensions plus time, for a total of eleven. As I've said in entries like "Time is a Direction" "Dr. Mel's 4D Glasses" and "What Would a Linelander See", my project insists that time is not a full dimension, it's just a direction within the spatial dimensions, so there's no need to count it separately. That's my two bits, anyway! Thanks for the information Rob, but in your video about the 10 dimensions, don't you include time as the fourth dimension as part of the 10? Just trying to get my head around it. I am going to watch the video again in the meantime. What we think of as "time" is just a way of moving through the spatial dimensions: that's why I say that time is a direction, not a dimension. What also becomes clearer is that the branching set of possibilities that we see before us are mirrored in the past as well: as Feynman's "sum over paths" shows, there are many ways we could have gotten to our current "now", not just the one that we believe we remember. This is discussed in entries like "Scrambled Eggs"
Great Rob. Thank you for taking the time to explain it to me.